Connecting Chiba and Kanagawa, the man-made island Umihotaru is an odd yet fascinating spot to rest, eat and shop while relishing the 360° view of the Tokyo Bay area. In this article, we will introduce you to its unique charm. Umihotaru was built in 1997 on an artificial island designed to structurally support the transitional point of the underground tunnel from Kanagawa and the bridge from Chiba. The tunnel section has been highly praised for its advanced engineering and it was ranked fourth place in CNN Travel’s “10 of the world's greatest tunnels” in 2016. Umihotaru means sea firefly in Japanese. The actual sea firefly is a kind of crustacean which glows at night in the sea. Just like its namesake, the island brilliantly illuminates the Tokyo Bay area at night as well. In this article, we'll be exploring the many shops, restaurants, and facilities of Umihotaru. The Tokyo Bay Aqua Line, or Trans-Tokyo Bay Expressway as it was originally known, was first surveyed in 1966. Its purpose was to reduce the travel time between the two industrial regions, Kawasaki(Kanagawa) in the east and Kisarazu(Chiba) in the west. It’s basically a toll highway consisting of two 10km-long underwater tunnels through the Kawasaki waters, one 5km-long bridge over Chiba waters, and two man-made islands in between. Umihotaru offers a huge parking area and a ventilation tower called The Tower of Wind (Kaze no to). If you visit Umihotaru in the morning like me, you will probably be welcomed by the scent of seawater and the bright morning sky. The floors one, two and three are parking areas, the fourth is for shopping and entertainment and the fifth houses restaurants and cafes. After taking the escalator directly to the fifth floor, I walked out into the open air. I could see cars driving through the bridge of the Tokyo Bay Aqua Line, birds gliding in the wind and the blue water glistening on the horizon. From the observation deck, you can see Kisarazu City just beyond the 5km long steel bridge. The city located is in Boso Peninsula, one of Chiba Prefecture's commercial fishing areas. After enjoying the great view of Chiba, I decided to stroll to the opposite end of the observation deck. From there you can see Kanagawa prefecture. This is a famous photo spot, especially at night, as it showcases Kanagawa prefecture as part of the backdrop. Displayed here is one of the eight cutter heads used to create the underground tunnels. 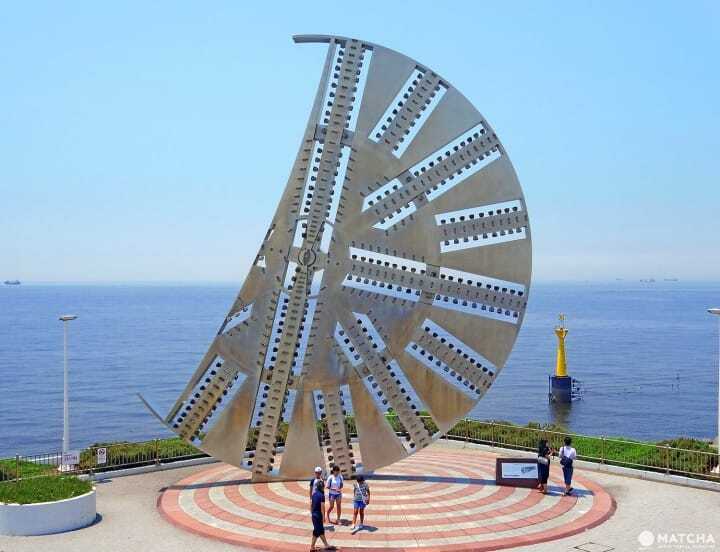 With a diameter of 14.14m, they used to be the largest in the world in the mid-90s. To the right is a faint image of the ventilation tower. For 100 yen, you can get a closer look at its engineering structure that resembles two sailboats of varying heights. One is 90m high, which is about the size of the Statue of Liberty, the other is 75m in height. If you want to know more, you can also head to the museum on the first floor dedicated to the engineering marvel Umihotaru. Past noon I could see the people filling up the Marine Court which offers an impressive sea view to the left. There are plenty of food stalls to choose from. Some offer succulent seafood for under 1000 yen. If you want a quieter ambiance you might want to consider one of the restaurants instead. If you visit Umihotaru you should try one of these flavorful clam dumplings. You can also buy them frozen if you want to share them with others later. Originally from Nagasaki, this Chinese-inspired dish called Chanpon noodles offers a generous mixture of vegetables and seafood like clams, prawns, and squid. The seafood comes from the famous fishing area of Boso. This dish is available at the Ushio Tei food stall and I highly recommend it if you like seafood. This set meal for 850 yen offers a refreshing mixture of the light taste of soba (buckwheat noodles) and the spicy and tender sliced pork. The food court offers a drink bar. You can get drink refills by buying a ticket then inserting it in the small box next to the coffee machine. After I filled my stomach with food and enjoyed the ocean view to its fullest, I moved to the Grand Cabin located on the fourth floor. It offers many shops, cafés and even a foot bath facility and a kid’s area. Tax-free shopping is available at this huge souvenir shop. This shop also sells the popular Umihotaru Memorial Pure Chocolate Pie. Kids and those who are young at heart are welcome to try their luck on the coin-operated games at the amusement arcade. What is the Best Timing to Visit? This day trip takes about 2 to 3 hours and it’s best to come in the morning to avoid the traffic. Umihotaru's peak visiting times are from 15:00 to 20:00 on weekends. If you come in the morning it will give you time to also visit other places in the area such as the Mitsui Outlet Park, which is located behind the Tokyo Bay Aqua Line. Most shops are open from 9:00 and close at 22:00. You are welcome to bring your pets but fishing and camera drones aren’t allowed. If you come by car make sure you have enough gasoline in your tank as a petrol station isn’t available on the island. If you’ve got an international license, it’s highly recommended to rent a car as you will be able to visit other destinations around the area as well. If you rent a car make sure you inquire about getting an ETC (Electronic Toll Collection) card in order to save 75% of the price compared to a cash payment at the toll booth. The ETC discount price starts from 640 yen for small cars and is up to 1320 yen for large vehicles. For electric cars, there are quick charging facilities on the 2nd and 3rd floor. Umihotaru is a 24-hour parking lot that offers a lot more. It is great for shopping, eating and relaxing when you’re in the Tokyo area. It also offers a great view of the ocean as well as Chiba and Kanagawa. Why not drop in for a couple hours before continuing to your next destination? 7 Shopping Spots In Kawasaki With Excellent Access To Haneda Airport! Ride A Train With The Moomins in Chiba Prefecture! Odaiba Travel Guide - 15 Must Do Things In Tokyo's Best Entertainment Spot!